Retailers operate in a dynamic industry, combining high volumes, low margins and intense competition. How could Würth Group streamline operations to trim costs, boost profits and win the retail race? Würth Group consolidated its mission-critical SAP® applications and databases on IBM® Power Systems™, delivering simplified operations and dramatically accelerated insight into business data. As a leading retailer of assembly and fastening materials for professionals, Würth Group continuously adapts to a constantly changing market. How could Würth Group boost process efficiency and enhance staff productivity, yet simultaneously reduce operating costs and increase profit margins—all while providing outstanding customer service? 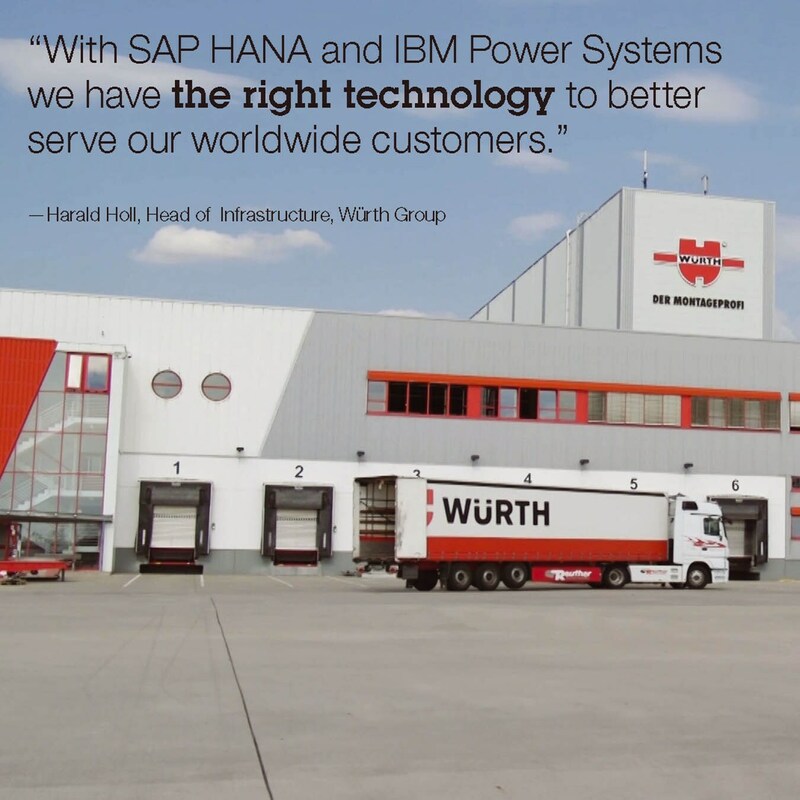 To manage its core business processes, Würth Group operates an extensive SAP ERP application and database landscape running on the IBM Power platform, including a large SAP Business Warehouse application running on IBM Power System E880 servers. At Würth Group, IBM Power Systems is the long-term strategic platform. Most of the company's SAP applications were already running in fully virtualized and highly automated environments on IBM Power Systems with the IBM AIX® operating system and Oracle Database. From many years of successful operation, Würth Group has gained extensive experience of the high levels of stability and reliability that IBM Power Systems servers deliver. Additionally, for its SAP Business Warehouse application, the group ran SAP HANA® hosted on scale-out x86 processor-based clusters. Managing the multiple servers in the cluster absorbed considerable time, and made it difficult to add computing and memory capacity to meet changing business demands. The Würth team decided to review its cost-efficiency options for the SAP HANA solutions, working with IBM and IBM Premier Business Partner SVA System Vertrieb Alexander. The joint SVA, IBM, SAP and Würth Group team collaborated closely to optimize the migration process, accelerating the procedure and reducing the migration risk. Moving SAP HANA to a scale-up architecture on IBM Power Systems enabled Würth Group to consolidate two separate environments onto a single infrastructure, standardizing operations and management processes. The advanced virtualization technology provided by the IBM Power Systems platform offers additional significant benefits for Würth Group. The company can now change the size of its SAP HANA databases dynamically, and add computing and memory capacity as needed to achieve the best performance. Moving to SAP HANA enabled Würth Group to provide up-to-date business data for analytics and reporting in every country around the world at 07:00 local time every single day. Stefan Beer says: "The key benefit for our organization after deploying SAP HANA on IBM Power Systems was that we can reduce the loading time from the operational systems to our SAP Business Warehouse systems tremendously. “In our statistics environment, we use SAP Business Warehouse powered by SAP HANA running on IBM Power Systems. Here we deploy hundreds of dashboards, analytical applications and reports. About 70 percent of our analytics workload comes from our sales staff. Getting quick insight into sales data is essential for our teams to compile tailored offers, and to ensure seamless and efficient customer service. The reporting capabilities also include fast ad-hoc analyses, to give our staff more flexibility. Würth Group wants to leverage the next generation of the SAP HANA platform and accelerate its complex, compute-intensive data analytics. The group plans to implement integrated analytics tools and features that will fully exploit the SAP HANA in-memory architecture to increase staff productivity further. Würth Group, headquartered in Künzelsau in Germany, is a world market leader in assembly and fastening materials. The group operates more than 400 subsidiaries in over 80 countries, and employs more than 71,000 people, managing about 125,000 products. Würth Group achieved total sales of EUR11.8 billion in the 2016 financial year. © Copyright IBM Corporation 2017. IBM Systems, Route 100, Somers, NY 10589. Produced in the United States of America, August 2017. IBM, the IBM logo, ibm.com, AIX, Power, Power Systems, POWER8, PowerHA, and PowerVM are trademarks of International Business Machines Corp., registered in many jurisdictions worldwide. Other product and service names might be trademarks of IBM or other companies. A current list of IBM trademarks is available on the web at “Copyright and trademark information” at ibm.com/legal/copytrade.shtml. This document is current as of the initial date of publication and may be changed by IBM at any time. Not all offerings are available in every country in which IBM operates. THE INFORMATION IN THIS DOCUMENT IS PROVIDED “AS IS” WITHOUT ANY WARRANTY, EXPRESS OR IMPLIED, INCLUDING WITHOUT ANY WARRANTIES OF MERCHANTABILITY, FITNESS FOR A PARTICULAR PURPOSE AND ANY WARRANTY OR CONDITION OF NON-INFRINGEMENT. IBM products are warranted according to the terms and conditions of the agreements under which they are provided. © 2017 SAP SE. All rights reserved. SAP, R/3, SAP NetWeaver, Duet, PartnerEdge, ByDesign, SAP BusinessObjects Explorer, StreamWork, SAP HANA, and other SAP products and services mentioned herein as well as their respective logos are trademarks or registered trademarks of SAP SE in Germany and other countries. These materials are provided by SAP SE or an SAP affiliate company for informational purposes only, without representation or warranty of any kind, and SAP SE or its affiliated companies shall not be liable for errors or omissions with respect to the materials. This document, or any related presentation, and SAP SE’s or its affiliated companies’ strategy and possible future developments, products, and/or platform directions and functionality are all subject to change and may be changed by SAP SE or its affiliated companies at any time for any reason without notice.